Artificial Lemon only,other accessories demo in the picture is not included. 20 x Artificial Lemon. Pattern: Lemon. 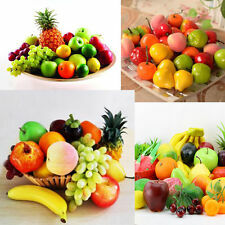 Made of high quality plastic and foam, beautiful and vivid fruit decoration. 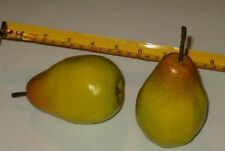 Type: Artificial Fruits. Feature: Package:1pc pineapple decoration Brand Name:FENGRISE Type:Event & Party Supplies Model Number:W1216-01 Occasion:Party Decoration Material:tissue paper Event & Party Item Type:party&holiday is_customized:Yes Type:Other Festive & Party Supplies Color:As the picture describetion Measuring approx. 21cm high, 12cm diameter. Finish off your party table decorations with this 8 inch tall yellow and green tissue paper honeycomb pineapple centerpiece. Perfect for luaus and summer parties. Easy to assemble and reusable. Place a cluster of these cute Tissue Pineapple Decorations on a cake plate for an eye-catching centerpiece, or space them along the buffet table. 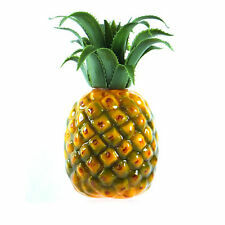 You could hang your pineapples from string or cord, or open them only halfway and tape to a wall or window. New Artificial Plastic-Apple Prop. Perfect prop for photography. Made of plastic material, hard to get fade, durable to use. Material: Plastic Foam PVC. Color: Red ( as picture show). The real color of the item may be slightly different from the pictures shown on website caused by many factors such as brightness of your monitor and light brightness. New Artificial Plastic Strawberries Prop. 6 Artificial Strawberry. Perfect prop for photography. Color: Red ( as picture show). Made of plastic material, hard to get fade, durable to use. Material: Plastic. 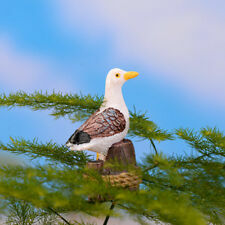 Due to the light and shooting angle, pictures may have slightly chromatic aberration. 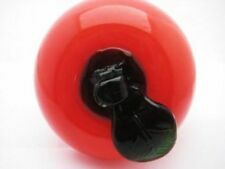 1 x High Artificial Red Apple Model PVC False Apple Prop House Kitchen Party Decoration Fruit. 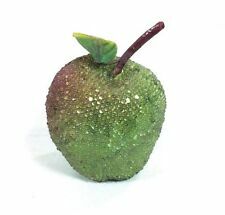 Very beautiful and life-like artificial Apple. Lifelike Banana Bunch Artificial Plastic Fake Fruits Decor Prop Party Decor. 1 Fake Banana. Compatiable with artificial apples, oranges, pears, tomatoes, peaches. Note: The real color of the item may be slightly different from the pictures shown on website caused by many factors such as brightness of your monitor and light brightness. Tongue Trick Prank Magic Horrible Tongue Fake Tounge Realistic Elasticity Toys. Modern Bathroom Vanity LED Light Acrylic Front Mirror Toilet Wall Lamp Fixture. Automatic Poker 1/2 Deck Card Shuffler Battery Operated Shuffling Machine Tool. Color:As shown. Item code:YW-048. Size:3cm(approx.). Beautiful and life-like artificial mini strawberries. Perfect for kitchen Party House decor etc. 20pcs mini strawberries. Also note that monitor settings may vary from computer to computer and may distort actual colors. Beautiful and life-like artificial mini strawberries. Perfect for kitchen Party House decor etc. 20pcs mini strawberries. That's our motto. And let's face it, everyone loves to find a bargain. It's human nature. Vintage Small Solid Wood Fruit Apples Lot Of 10 Assorted Wood Same Day Shipping! 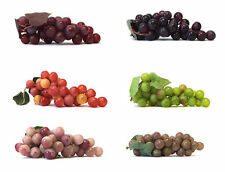 How Can I Use Decorative Fruit? 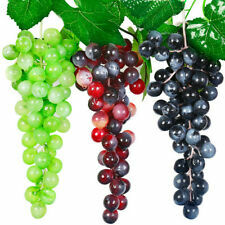 Adding a fresh element to your home is a clever use of artificial fruit and vegetables in any season. 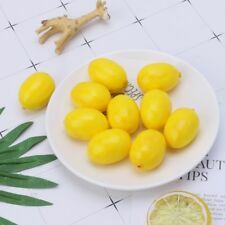 Decorative lemons spruce up a dining room table in springtime or artificial apples line a mantle in the fall. 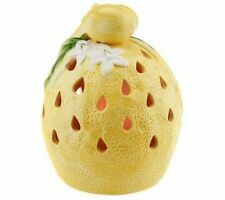 Fake fruit provides a natural element to home decoration without worrying about switching out the real thing. How Do I Display Decorative Food? Fake Citrus: Fill a clear bowl or vase with artificial fruit such as lemons, oranges, or limes in the spring and summer. This pop of colour works in a minimalist or country-style home. These also pair well with Christmas decor. Thanksgiving centrepieces: Cluster a sustainable cornucopia of artificial fruit and vegetables, incorporating the colours of the fall such as green, red, and orange. Artificial food can weave between candles, ornaments, and other tablescape accents. Casual Decor: For year-round decoration, a mixture of fruit and vegetables in a traditional fruit bowl creates a sense of welcome. Fill a wooden serving bowl with apples, grapes, or even bananas for a realistic feel. What Are Artificial Fruit Items Made From? Fake fruit and vegetables can be made from a list of materials. Some come across as more realistic than others, but it's all a matter of taste. Plastic: a popular material for fruit and vegetables, plastic food is safe around the house, as it will not break, and remains lightweight for crafting and clustering together. 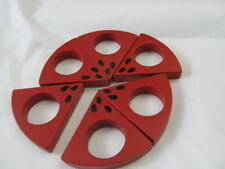 Ceramic: For more of a classic look, ceramic fruit adds an ornamental touch to a kitchen or dining table. This is less of a traditionally artificial look, and leans more toward a decorative feel, as it does not often have a lifelike, edible appearance. Foam: Great for crafts and fruit displays alike, foam artificial fruit is both lightweight, easy to secure displays, and more realistic due to its lack of shine. Can I Craft with Decorative Fruit? Wreaths: For wreaths around the holidays and floral arrangements in the spring, attach foam apples, grapes, and other festive fruits for unique home decoration. Garlands: String together artificial food items in an array of colours. Choose artificial red fruits like berries and apples or add pops of green throughout a bountiful vegetable display with artichokes and eggplant. Weddings: Safer and more cost-effective for wedding party decorations, decorative artificial food items work well in centrepieces or throughout ceremony decor. Fill table vases with fake fruit or line the bar with fake succulents. Fake fruit can bulk up floral centrepieces when working within a budget.